Mark Sheplak is currently a Professor holding joint appointments in the Department of Mechanical and Aerospace Engineering and the Department of Electrical and Computer Engineering at the University of Florida. Prior to joining UF in 1998, he was a postdoctoral associate at the Massachusetts Institute of Technology’s Microsystems Technology Laboratories, Cambridge, MA from 1995-1998. He received a BS degree in 1989, a MS degree in 1992, and a Ph.D. degree in 1995 in Mechanical Engineering from Syracuse University, Syracuse, NY. During his Ph.D. studies he was a GSRP Fellow at NASA-LaRC in Hampton, VA from 1992-1995. His current research focuses on the design, fabrication, and characterization of high-performance, instrumentation-grade, MEMS-based sensors and actuators that enable the measurement, modeling, and control of various physical properties. Specific applications include technology development to enable large-channel count micromachined directional microphone arrays for aeroacoustic noise source localization and miniature skin-friction sensors for aerodynamic drag characterization and flow control. He is a member of the Multi-functional Integrated System Technology Center (MIST) and the Florida Center for Advanced Aero-Propulsion (FCAAP). He is member and past chair of the AIAA Aerodynamic Measurement Technology Technical Committee. He is also an associate editor for Journal of the Acoustical Society of America (JASA) and JASA Express Letters. 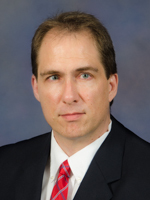 He is an associate fellow of AIAA and a fellow of the Acoustical Society of America.